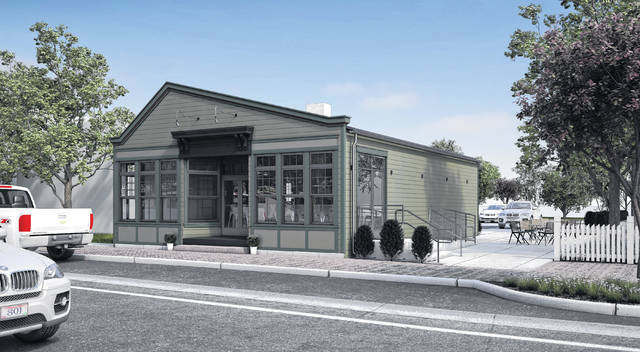 Pictured is a rendering of the planned changes to the former retail shop at 26 W. Olentangy St. in downtown Powell. Dustin Sun, owner of Espresso 22 in Powell, plans to remodel the building in order to open up a tavern. Plans to convert a former retail shop in downtown Powell into an Asian fusion restaurant are no longer on the table after the city’s Planning and Zoning Commission last week signed off on an administrative review of plans for a different use for the site. Dustin Sun, owner of the Espresso 22 coffee shop in downtown Powell, informed commission members that upon closer inspection of the property at 26 W. Olentangy St., it was discovered that various issues like the foundation’s inability to support the planned designs for the Asian restaurant have squashed the idea. Instead, he now plans to renovate the building and open a tavern. “(We would have been) better off just to tear it down and rebuild because if we were going to do what we were going to do originally, it just didn’t make financial sense,” Sun said. Instead of having a restaurant that would have been 80 percent focused on food and 20 percent on drinks, he added, the tavern will be more of a 50/50 split. According to the new plans presented to the commission by Sun and Matthew Althouse, architect for the project, the current structure will be renovated with the biggest change being the demolition of the eastern portion of the building (third addition to original structure) to create an outdoor patio. “We feel this is a good improvement,” Director of Development David Betz said. A city staff report states the plan is for the tavern to have 40 seats (24 inside and 16 outside), while available parking spots will total 15 with 10 to be located on site and five to be constructed just off an alley to the north of the property. Prior to approving an administrative review of the new plans for 26 W. Olentangy St., several commission members stated they prefer the new-look project from an aesthetic point of view. “The smaller (the building) gets, the better it gets,” commission member Joe Jester said. By a 6-1 vote (commission member Bill Little voted no), the commission approved an amendment to the final development plan for the Armita Plaza shopping center currently under construction at the northwest corner of West Olentangy and Lincoln streets. The amendment will allow the rear portion of the roof design to be altered by removing the approved sloped design in favor of extending the walls higher to create more of a parapet design on the side of the building facing the parking lot. Project architect Tom Beery said the applicant requested the change as a way “to cut costs” after the original general contractor backed out, which led to subcontractors raising their prices. He added the approved change will save the applicant a few hundred thousand dollars. Little took a stance against approving the amendment, citing the commission has promoted four-sided buildings in the past, and he added while the back side of the complex doesn’t face a street, it does face residences. An administrative review for the proposed construction of a new 2,757-square-foot bank and drive-thru at 10628 Sawmill Parkway was approved by the commission. Alyssa Lowry, senior architect at Architectural Alliance, presented the project which seeks to construct a Middlefield Bank location in an outlot in front of Target. Betz said city staff is “happier” with the newest plan revision that addresses staff concerns over the screening of rooftop units, and he acknowledged the fact that while the city can recommend improvements to the plan, Target ultimately has the final say per the property development agreement.